Like many writers in their early days, David Hewson wasn’t exactly rolling in it. But years later – having turned a popular TV series, The Killing, into a hugely-successful series of novels – he’s perhaps made, well, a killing. He’s been a journalist (having helped launch The Independent newspaper) and writer for years. 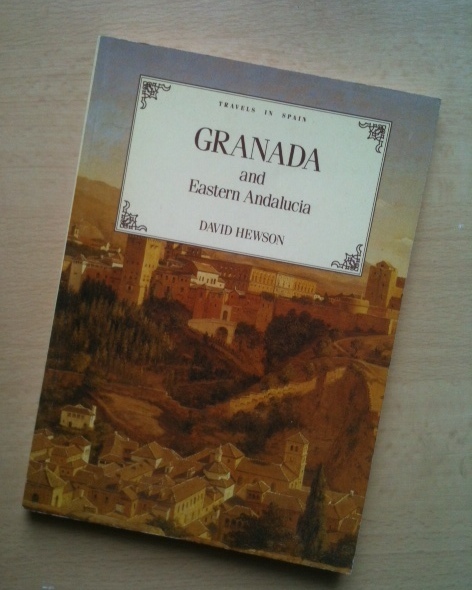 In 1987 David, by his own admission, needed a few bob so traveled around southern Spain and wrote Granada and Eastern Andalucia (he also wrote Seville and Western Andalucia and Mallorca). We bought a copy and love it, including the cute hand-drawn route maps – although the illustrations are poor. The first 15 pages describe, in a nutshell, the history, geography, architecture and food of the region. The book continues with twelve days of travel by car covering Málaga, Granada, Córdoba, Jaen, Ubeda, Carzorla, Guadix and – much to our delight, but hardly surprising – Las Alpujarras. The last day he heads south to the coast – Salobreña, Almuñécar and Nerja. We got the book in a real bookshop, in London! David joked that what we paid for it (£3.50) was probably what he earned from it. David says: ‘It’s funny seeing these old books get resurrected on Amazon now – so hopelessly out of date.’ And of course, when travel books mention places to stay, and whether they take Diner’s Club cards, there are plenty of bits to skip. Having said that, the places that are still here today must be doing something right. This book – a personal observation of a beautiful part of Spain – is a great introduction to eastern Andalucia, its cities, towns and villages. Oh, there’s a recipe for Ajo Blanco (cold almond and garlic soup). In 1996 David wrote Death in Seville – one to download or pick up in a shop. Here’s his website with an up-to-date blog.